I AM DEEPLY discouraged after reading new SRC chairman Bill Green’s remarks about Dr. Hite’s “impatience” with the Philadelphia Federation of Teachers during contract negotiations, and in particular the demand for “labor” concessions. Mr. Green seems to shrug off the fact that the School District of Philadelphia is in a starting position 20 percent below competing districts’ salaries in the very nearby suburbs. He seems to forget that our class sizes are much higher than our peers’. He seems to forget that many educators here spend at least $1,000 per year out-of-pocket for books and basic classroom and office supplies. Urban educators have a different job in a much different environment, which most will agree is also more complex. Start with the children we serve and advocate for. They are even further behind suburban counterparts than teachers. On top of enduring oversized classes, they’ve lost support of counselors in spite of dramatically higher childhood-trauma rates. They’ve lost school nurses, secretaries and librarians. They’ve lost engineering and maintenance staff. The kids’ civil rights are likely violated already with governmental decisions to underfund so precisely and so radically their “separate but equal” education. Among further “differences,” many school buildings are unsafe for children: unsafe and insecure from criminal and classmate predators, unsafe and often chaotic because we don’t have the noninstructional staff necessary to make sure that our children are safe in the hallways, courtyards, bathrooms and cafeterias, all along with unsafe plumbing infrastructure (“skull and crossbones” water supply), mold, rodent infestations and more. Not to mention the expectation that elementary-age children will walk for up to a mile, climbing over (or around, into traffic) the winter snow mounds and ice pack that are the reality of neighborhood streets for days and days after storms. Don’t forget the lingering trash and recycle mounds blocking sidewalks. Can you imagine any one of these hurdles being accepted as the “norm” in next-door suburbs?. All that said, I choose to be here. I live here in the same environment as the children. I have made that choice every year for 13+ years. I work for the kids as a calling. I consciously choose this totally different reality of classroom tasks and environmental hurdles over suburban counterparts. That is all on me, up to now. Now the governor, the SRC and Dr. Hite “impatiently” ask us to do our “share” . . . and take even further pay cuts and accept a separate additional salary reduction for “benefits.” It would be laughable if it was not so discouraging, demeaning and unprofessional. I would certainly consider paying more for benefits (like the suburbs) when I am paid a salary like the suburbs. Otherwise it is prima facie absurd politicking. It is hurtful to be manipulated for salary and then blamed for what’s wrong with our school district, particularly from much more highly paid “administrators” (and SRC members), beginning with the trail of eight or nine different “heads” at the top since 2001. Most if not all the heads of the district and SRC have been hired guns, expensively recruited and expensively terminated. And few recruited from within the district boundaries, actually living and working within the students’ environment. 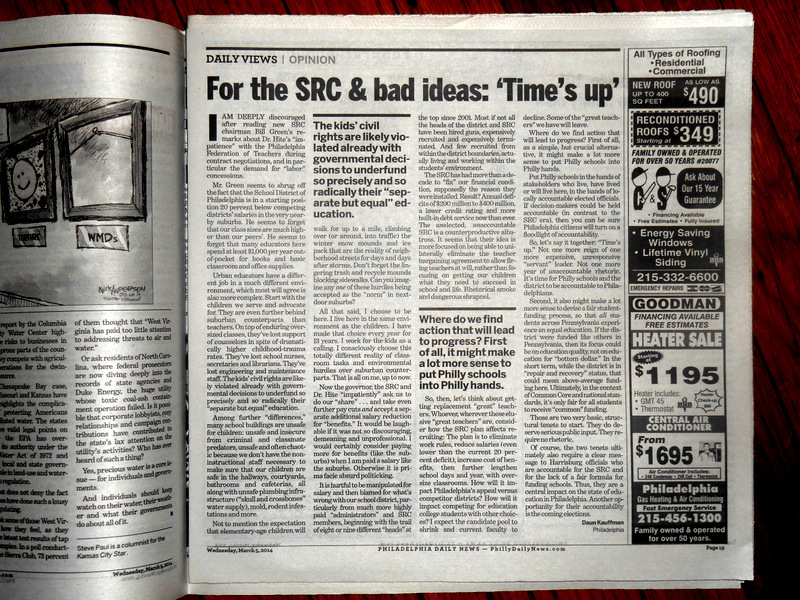 The SRC has had more than a decade to “fix” our financial condition, supposedly the reason they were installed. Result? Annual deficits of $200 million to $400 million, a lower credit rating and more built-in debt service now than ever. The unelected, unaccountable SRC is a counterproductive albatross. It seems that their idea is more focused on being able to unilaterally eliminate the teacher bargaining agreement to allow firing teachers at will, rather than focusing on getting our children what they need to succeed in school and life. Rhetorical smoke and dangerous shrapnel. So, then, let’s think about getting replacement “great” teachers. Whoever, wherever these elusive “great teachers” are, consider how the SRC plan affects recruiting: The plan is to eliminate work rules, reduce salaries (even lower than the current 20 percent deficit), increase cost of benefits, then further lengthen school days and year, with oversize classrooms. How will it impact Philadelphia’s appeal versus competitor districts? How will it impact competing for education college students with other choices? I expect the candidate pool to shrink and current faculty to decline. Some of the “great teachers” we have will leave. Where do we find action that will lead to progress? First of all, as a simple, but crucial alternative, it might make a lot more sense to put Philly schools into Philly hands. Put Philly schools in the hands of stakeholders who live, or will live here; in the hands of locally accountable elected officials. If decision-makers could be held accountable (in contrast to this SRC era), then you can be sure Philadelphia citizens will turn on a floodlight of accountability. So, let’s say it together: “Time’s up.” Not one more reign of one more expensive, unresponsive “servant” leader. Not one more year of unaccountable rhetoric. It’s time for Philly schools and the district to be accountable to Philadelphians. Second, it also might make a lot more sense to devise a fair student-funding process, so that all students across Pennsylvania experience an equal education. If the district were funded like others in Pennsylvania, then its focus could be on education quality, not on education for “bottom dollar.” In the short term, while the district is in “repair and recovery” status, that could mean above-average funding here. Ultimately, in the context of Common Core and national standards, it’s only fair for all students to receive “common” funding. Those are two very basic, structural tenets to start. They do deserve serious public input. They require no rhetoric. Of course, the two tenets ultimately also require a clear message to Harrisburg officials who are accountable for the SRC and for the lack of a fair formula for funding schools. Thus, they are a central impact on the state of education in Philadelphia. Another opportunity for their accountability is the coming elections. Original on-line “Comments” at Philly.com: click here. Daun Kauffman, from Philly.com . Great points, good suggestions. FYI, SRC members are unpaid. Thank you Anne! I did try to adjust the grammar for clarity. I also note that Bill Green makes a sky high income at his ‘day job’.